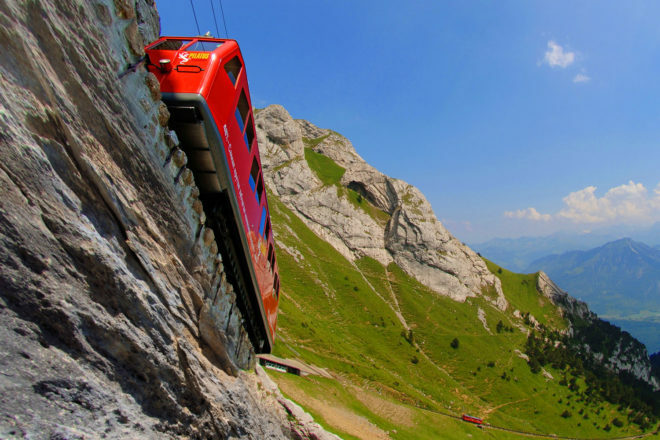 Take a journey up to the clouds on Switzerland’s steepest cogwheel railway. Oberhofen Castle with its medieval lake tower is located on the shore of Lake Thun near Bern. Hotel Pilatus-Kulm sits at the top of Mt Pilatus. 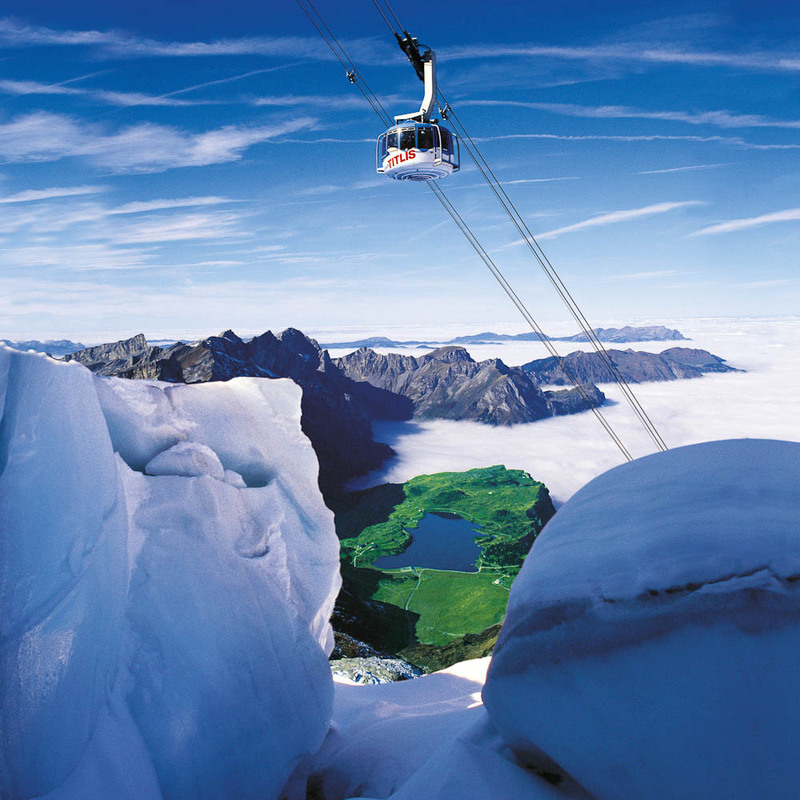 Titlis Rotair is the world’s first revolving cable car. Swiss capital Bern’s most recognisable symbol – the Zytglogge tower. The hyper-efficient Swiss rail system winds its way into every nook and cranny of this postcard-perfect country, making it ideal for family holidays. Nikki Wallman test-drives an ideal starting itinerary. you and your partner may even enjoy a little romantic reconnection. got some serious family album material. This itinerary should help get the, ahem, wheels turning on the plans for your family rail adventure. 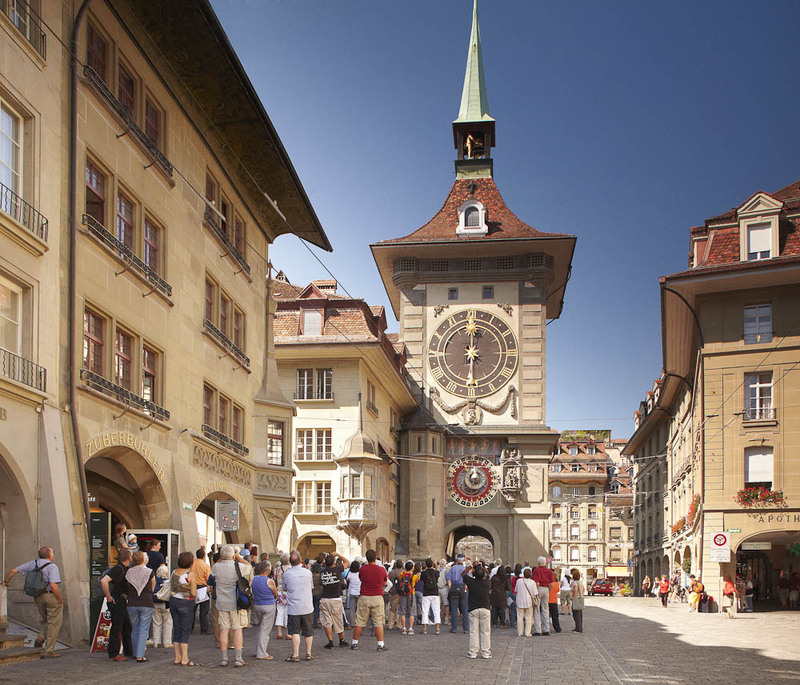 Around one hour from Zurich by train is the UNESCO World Heritage-listed Swiss capital Bern. Step back in time around the Old Town, particularly the ancient flag-lined Kramgasse (‘Grocer’s alley’) where Albert Einstein lived for a while working on his Theory of Relativity (visit Einstein Haus: einstein-bern.ch). He may have been interrupted every now and then by the clanging of the Zytglogge, an enormous clock tower dating back to the 12th century – the clock workings were added in the 16th century. Climb the tower for incredible views across the ancient terracotta rooftops and to see the intricate inner mechanics of this enormous beast of a timepiece. Bern’s city mascot, the bear, features on its coat of arms – and you can see the real thing at the hillside Bear Park just across the Aare River. The 6000-metre-square grounds include a pool and tunnels and replaced the old (and much-criticised) ‘bear pit’ in 2009. An hour-long train ride takes you to Lucerne, where it’s a quick platform change for the next train to Engelberg. Another blissfully picturesque hour later, you’ll pull into this mountain town nestled at the foot of Mt Titlis, snowcapped all year round. The ascent itself is an adventure, comprising two chairlifts, a gondola, and a revolving cable car, which allows you to gawp at 360 degrees of spectacular alpine views. In winter, there’s skiing areas for beginners and children, including Gerschnialp and Trubsee. In spring and summer, there’s everything from hiking to pony rides; rope parks to rowing. Despite being late May, it’s snowing heavily, so we head to the glacier park. First I’m hurled into the whiteout on a snow tube (scary at first, but I’m whooping with joy after 10 seconds); and then I face my serious fear of heights with the Titlis Cliff Walk – the highest suspension bridge in Europe. Thankfully the heavy snow softens my view of the sheer drop below, and I complete my challenge, whooping again. Engelberg/Mt Titlis is a Swiss Tourism ‘Families Welcome’ area – which means a guestcard given to you upon check-in at your hotel or guest apartment qualifies your family for certain free activities. Ask at the Visitor Centre in town for more information. Stop off in this tiny town to visit the very cute Hergiswil Glasi glass museum. A sound and light show leads you through elaborately staged sets that bring the history of glass to life, before you emerge into a functioning factory to watch the workers blowing and shaping hot glass. There’s also puppet shows, a mirror maze, restaurant, bar, and shop. A few minutes around the lake by train will take you to Alpnachstad, the starting point for the world’s steepest cogwheel railway. The half-hour journey is unforgettable: the slow, steady ascent of the little red train; the straining click-clack of the wheels turning; the green and blue vistas of forests, valleys and lakes unfolding like a fairytale land as you inch higher and higher into the clouds. At the top of Mt Pilatus, the sense of drama and mythology continues. Kids will love the legend of the mountain’s resident dragon. There’s an icicle-ridden ‘dragon cave’ tunnelled through the mountain-top, and even an impressive online game, ‘Hunt for The Dragonstone’. To pack it all into one day, try the Golden Round Trip (May–October), which includes a boat ride on Lake Lucerne, the cog railway, panorama gondola and aerial cableway. Or stay at the mountain-top Hotel Pilatus-Kulm. It’s a magical experience whether you have clear weather or are snowed in (Yvette, my guide, tells me Pilatus is known as Vivaldi mountain – “You know, the Four Seasons!”). Descend the mountain via gondola and cableway, stopping at the rope park halfway down to indulge any daredevils with ziplines and mountain slides. Situated on the bucolic shores of Lake Lucerne, Lucerne is crammed with historical highlights, including the 14th-century Chapel Bridge and Water Tower, and the Lion Monument, a statue of a dying lion carved into a rockface to honour Swiss soldiers who died fighting for the French forces in 1792. (Mark Twain called it “the saddest and most moving piece of rock in the world.”) Lucerne is also known as a ‘city of festivals’, with a full calendar including a Blues Festival, Comics Festival and rowing regattas. Don’t miss the interactive playground of the Swiss Museum of Transport. The grand scale of this place is matched only by the painstaking detail and vast scope of what’s on display, from old fighter planes and hollowed out Swiss Air planes, to the first locomotives, vintage cars and a planetarium. It’s a fitting way to end a trip that’s as much about the journey as each destination. How to get there: SWISS offers daily connections from all major Australian cities to Switzerland from $1750. When to go: Winter brings snowy adventures; spring and summer unveil the sparkling streams, flower-strewn meadows and other alpine delights. Best thing about Switzerland: The Swiss Pass is one convenient ticket providing between four and 22 consecutive days, or one whole month, of unlimited travel on all Swiss public transport (barring some mountain railways and cable cars, which are 50% cheaper with the pass). Kids under 16 travel free. The Swiss Pass also includes free admission to over 470 museums. Purchase at myswitzerland.com/rail and request a Swiss Family Card at the same time. Worst thing about Switzerland: It’s expensive. But, for a once-in-a-lifetime journey, it’s worth it. Check train timetables at sbb.ch/en/home. Some alpine restaurants and shops close in the shoulder season; villages like Engelberg were quiet in May when we visited. Swiss trains are renowned for their efficiency, cleanliness and safety – but theft does happen. Always keep your luggage within eyesight and close range.